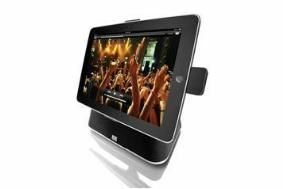 UPDATE: Altec Lansing Octiv 450 dock now compatible with iPad 2 | What Hi-Fi? Altec Lansing has released an additional adapter with its Octiv 450 dock system, making it compatible with both versions of Apple's iPad. The kit is available free of charge to existing owners of the Octiv 450, who can upgrade it to support the iPad 2. Docks for Apple's ubiquitous iPhone/iPod may be two a penny, but to date there have been relatively few capable of handling the iPad. That's all about to change, and we expect a rush of new models coming to market in time for Christmas. The latest is from Altec Lansing in the shape of this, the £130 Octiv 450. A rotating arm allows the iPad to be viewed in landscape or portrait mode, and the screen can also be tilted forwards and backwards for the optimum viewing angle. There's a wireless remote control, 3.5mm input for connecting other devices and automatic charging of an iPad/iPhone/iPod when it's docked. Altec Lansing says its Audio Alignment technology "provides distinctive centre channel voicing and enhanced stereo delivery for distortion-free sound even at high volume". The Octiv 450 has just been awarded an Innovations Design and Engineering Award from the Consumer Electronics Association in America. It will be available in the UK from December 1st at Apple stores, John Lewis, Dixons and PC World. You can see more CES 2011 Innovation Award winners in our special blog.